“I never create an image when I want to build a house.“ Thus Mies van der Rohe stated during interview with the Bauwelt magazine in 1964. He did, however, produce a wealth of collages and montages. These spatial compositions are some of the most interesting and most beautiful works of Modernism. Ludwig Mies van der Rohe (1886–1969) is one of Modernism's great architects. In his hometown of Aachen Mies was appreciated to the basic principles of building crafts. It was in Berlin that the young architect learned about the “great form“ when working with Peter Behrens. Once the bourgeois, craft-centred society of the German Kaiserreich collapsed after the First World War production in architecture and the visual arts changed fundamentally. Experiment and optimism inspired innovative designs. The free-flowing spaces in Mies van der Rohe’s Barcelona Pavillon expressed openness as the new paradigm of the Weimar Republic, but also a desire for order and measure. 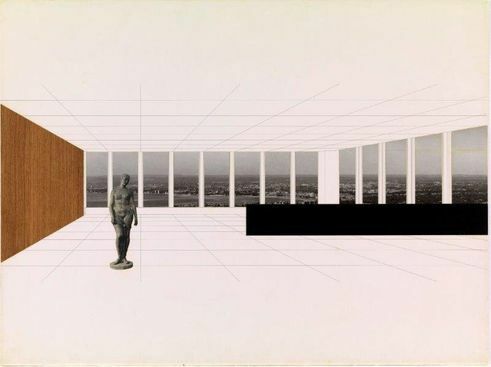 Mies van der Rohe, Ludwig (1886-1969) | Georg Schaefer Museum Project, Schweinfurt, Germany, Interior perspective with view of site, 1960-1963. New York, Museum of Modern Art (MoMA) Mies van der Rohe Archive. | © The Museum of Modern Art, New York/Scala, Florence / VG Bild-Kunst, Bonn, 2016 Serving as the last director of the Bauhaus Mies van der Rohe focused on a disciplined teaching of architecture. Through clarity in structure, the new art of building aimed to challenge the chaos of the modern world. Mies van der Rohe left Nazi Germany as late as 1938. He settled in Chicago where he continued to develop his approach in teaching and constructing a new language in architecture. His buildings with their elegance of abstract form finally made Mies van der Rohe world famous. The Neue Nationalgalerie in Berlin, opened in 1968, was the last great building of his architectural career. Throughout his lifetime, Mies van der Rohe created his designs by overlaying concrete conditions with general insights. Nowhere is this more evident than in his many montages and collages. During periods of re-inventing himself as an architect, Mies van der Rohe created powerful spatial images that continue to fascinate us today. The collages and montages display a juxtaposition and coexistence of continuity and new beginnings. 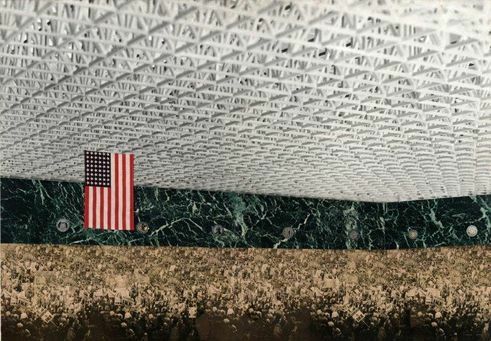 Mies van der Rohe took inspiration from the imaginative collages of avant-garde artists. Advertising and contemporary experiments with film portrayed the modern metropolis as a place of constant movement. In 1922 Mies van der Rohe created provocative and dazzling photomontages of his proposed high-rise building on Friedrichstrasse in Berlin. They are like film stills, frozen in time, and relay a dynamic image of the city and of society as a whole. Once Mies emigrated to America these illustrations of urban space gave way to depictions of interior spaces. These large format perspectives draw the spectator right into the image. 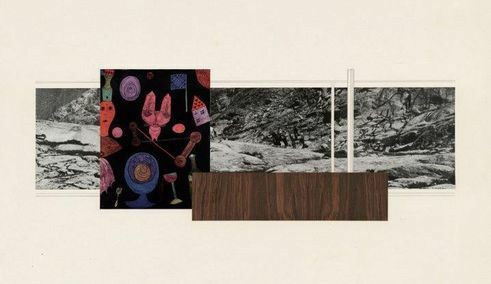 Reproductions of artworks can be seen in many of Mies van der Rohe’s collages. Figurative sculptures by Aristide Maillol and Wilhelm Lehmbruck are positioned freely in open space. 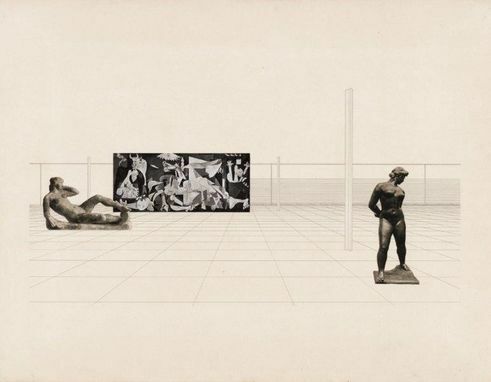 Ludwig Mies van der Rohe | Museum for a Small City,1942-43. Interior Perspective. New York, Museum of Modern Art (MoMA) The Mies van der Rohe Archive | © The Museum of Modern Art, New York/Scala, Florence / VG Bild-Kunst, Bonn, 2016 Wall-sized paintings by Picasso and Klee become integral components of the architecture. The presence of these sculptures and picture walls set the beholder and the pictorial space in a pulsating dynamic relationship. The gaze of the spectator is drawn into the depth of the spatial composition, but remains, nevertheless, caught on the surface. In these images, scale is kept vague. Are the sculptures really life-size? It is by using this ambivalence of scale that the collage is able to maintain a dynamic relationship between the presence of form and the spatial field, captivating the beholder again and again. Through this restless shifting of perceptions and by dissolving familiar relationships Mies van der Rohe relays the sensation of uncertainty in space and time. The beholder is drawn into the ever-expanding pictorial space of the new architecture and into the maelstrom of modern life. When observing the collages and montages in detail and close up, we can identify a distinct interplay. On the one hand, a modern future is being announced with exacting technical precision, while on the other hand, traces of artisanal craftsmanship remain clearly visible in the picture. Every now and again carefully cut out pieces of veneer are incorporated in very precise line drawings. 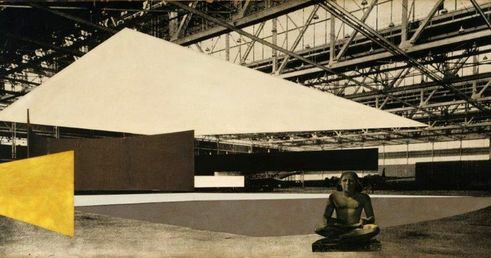 Mies van der Rohe, Ludwig (1886-1969) | Convention Hall. Chicago, Illinois, 1952-54. Interior perspective. Preliminary version, 1953. New York, Museum of Modern Art (MoMA). Mies van der Rohe Archive | © 2016. The Museum of Modern Art, New York/Scala, Florence Contrasting the rigid order of a long-span roof structure, there is a surprisingly vivid gold-yellow wall, or a small flag draping down over a crowd of people assembled from magazine photos. Sometimes one can identify touches of irony and Mies’ dry humour: a painting by Kandinsky turned on its side, an antique Buddha sitting calmly between modern sculptures, the view through the panorama window in one of his early American projects showing a couple of film cowboys. Mies van der Rohe’s spatial compositions blend the practical approach of the designing architect and the sensitivity of a visual artist. The creative technique of montage accompanied the architect throughout his life. In his collages the part and the whole are precisely harmonised with one another. In the same way, the structure of an entire building is expressed in its details. Beyond serving a purely useful purpose, these collages and montages by Mies van der Rohe are works of art in their own right. They are still considered innovative and enigmatic today. The modern spatial images by Mies van der Rohe were avant-garde long before his buildings broke new ground in a similar way in the realms of architecture. To accompany the exhibition “Mies van der Rohe: Collagen aus dem Museum of Modern Art, New York“ in the Ludwig Forum in Aachen and in the Museum Georg Schäfer in Schweinfurt, from 26 February until 28 May 2017, there is an abundantly illustrated catalogue with excellent commentary: MIES VAN DER ROHE: MONTAGE. COLLAGE, Aachen, Ludwig Forum. Andreas Beitin, Wolf Eiermann & Brigitte Franzen (Hg.). Aachen/Schweinfurt 2016/17. Copyright: Text: Goethe-Institut, Jan Frohburg. This work is licensed under a Creative Commons Attribution – Share Alike 3.0 Germany license.